Mary Lou Zeek Gallery does it again! I am very pleased to have four pieces featured in this group exhibition, including May, at left. This will be a show not to miss. Sitka Center for Art and Ecology is located just north of Lincoln City on the beautiful Oregon Coast. I am delighted to offer my printmaking workshop at Sitka this summer. 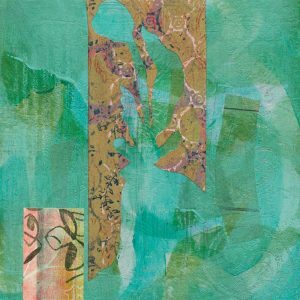 Combine a variety of techniques to create layered monotype prints in this three day workshop. 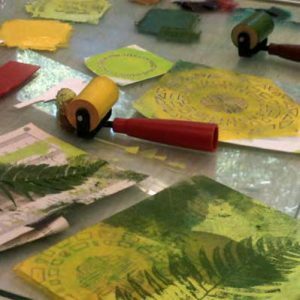 Make your own stencils, printing blocks and relief plates and learn to create hand-printed collage papers. 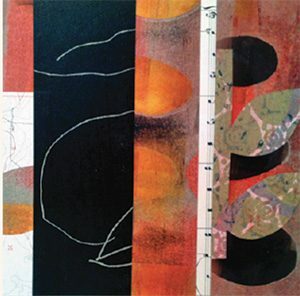 Develop a monotype series using your handmade tools, a ghost print technique, vibrant layers of oil-based inks and the chine collé method of collage. Having great fun in the studio this winter; working on collages for a show at Luke’s Frame Shop in May. First I created a collection of hand-printed papers using stencils,relief plates,oil based inks and acrylic glazes. I am now layering the patterned papers with monotypes, etchings, and bits of old maps and sheet music. These new works explore playful juxtaposition of pattern, line and color. Look for show details this early spring.